Had lunch with a lovely couple from Canada today. Pat and Merv. They have been coming to SMA for 12 years. This is the first year they have not driven. I've been asking for opinions of everyone who drives here about which routes they take, where they stay, good hotels etc. etc. Pat and Merv drive down through Great Falls, to Arizona then cross at a tiny border crossing in New Mexico and straight on through to SMA. It takes them 7 days. I've heard people doing it in 5 days, however, they are driving 8 - 10 hours a day. I don't want to do that, especially if I'm alone. So, I'm going to have to do some good research on this. I like the idea of missing LA altogether. Even if there is a 'ring road', with my luck I would take the wrong clover leaf and end up in Watts at midnight. No, I think an alternate route would be fine. Research, research, research. Decisions to be made. 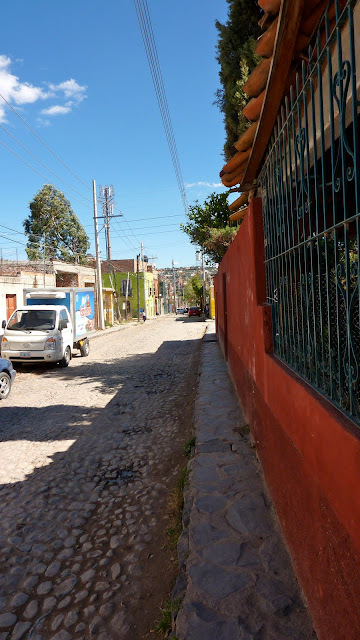 After being at the casita the other day, I walked down the 'big hill' to the market, then took a taxi from there. Didn't see another gringo all the way down. I think I can walk down, however, coming home will be another thing. A bus or taxi is in order, especially if I am carrying anything. Took some photos on the way. Night: Partly cloudy skies. Low 46F. Winds WSW at 10 to 15 mph.